Size of Male: 12-18 lbs., 12-14 in. Size of Female: 10-15 lbs., 12-14 in. The lively, cheerful Lowchen has existed as a companion dog for more than 400 years. These bright, outgoing little dogs likely originated in Germany and were popular during the Renaissance with court ladies who kept them as comfort dogs. They also used them as footwarmers. Today the Lowchen still makes a great companion dog and they’re great with children. The exact origin of this dog breed is unclear. It’s thought that they may have originated as a dog of the bichon type but that is only speculation. Dogs resembling the Lowchen (which means “little lion” in German) are seen in paintings as far back as the 16th century. 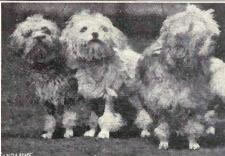 Dogs of this type, kept in the breed’s lion cut, were kept at court by ladies during the Renaissance. The dogs were purely companions. They slept in the bed as footwarmers. It’s also said that keeping the dogs in a hair cut that exposed their skin prevented flea infestations, which were a problem during the 1600s. The breed nearly disappeared in the 19th century and it has been very rare in recent years. At one time it was considered the rarest breed in the world. Numbers are still very low but they are much more popular than they once were. They were accepted into the AKC in 1996. Also known as The Little Lion Dog, this breed is highly intelligent and eager to please. These little dogs are bright, cheerful and friendly. They are outgoing and sociable. They are really one of the best kept secrets of the dog world. They are affectionate and great with children. They’re playful, active, happy dogs. They get along well with other dogs and other pets. They look delicate but they are actually very tough little dogs. They will bark to warn if a stranger approaches. They may bark or dig at times. They are highly recommended as a family pet. Living Environment – The Little Lion Dog makes an excellent apartment dog. They are small and they don’t shed very much. They are considered a good dog for people with allergies. They also enjoy having a small yard of their own. Grooming – Grooming for this dog breed is not difficult. These dogs should be brushed out regularly to prevent mats from forming. They are usually kept in a traditional lion clip. However, some owners keep their dogs in an all-over puppy cut. Talk to a dog groomer about how you would like your dog to look. Diet & Exercise – Dietary needs for this dog breed are considered normal. They need a moderate amount of daily exercise that can be met with a good daily walk. Play in a fenced yard can also meet their needs. Health – In the health department, this is considered a relatively healthy breed. No single health problem plagues the breed in great numbers. Cataracts, progressive retinal atrophy and luxating patella (slipped kneecaps) can be problems in the breed. If you are interested in this dog breed you should talk to a breeder about possible dog health problems. The Lowchen is an extremely smart little dog. They also have a strong desire to please their owners. In the dog training department, these dogs are known for being very easy to train. They can be willful and stubborn at times, but this is true of most breeds occasionally. The Little Lion Dog is also gentle and sensitive. Use positive dog training methods (praise, reward) and you should be able to train your dog very easily.